FlipBelt is one of the best options to store your accessories while working out or performing any physical activity. The belt is made from a stretchy material which a minimalistic design which means it will be perfect for any type of activity where you need your hands-free. The basic difference between these two models is that Classic has all its four pockets as openings in stretchy fabric, Zipper has one of the four pockets with zipper. Zipper is also a little bit wider (1/2″) than Classic. Zipper is slightly expensive. 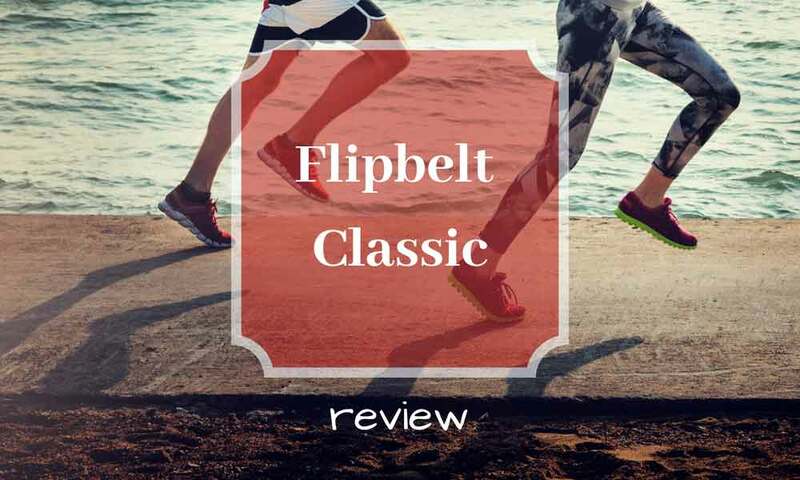 This review is about the FlipBelt Classic. Most of the things mentioned in this review are also valid for FlipBelt Zipper. Here you can find the our updated review of FipBelt Zipper. FlipBelt Classic is one of the most simple running belts. Tubular fabric with pockets that you slide on your hip. It can be a good solution for running, walking, cycling or even bodybuilding. This is because it represents a simple yet innovative solution for all of your fitness storage needs. Since most modern smartphones are constantly getting bigger and bigger, it might be difficult to find the right design for your needs. And space gets tight if you have a large protective case on your phone… But there`s more to the belt which can also be a good base for money storage, even when traveling. You have to remember that it doesn’t have a quick release. You have to step in and out of it. But it’s not a big deal when you find a right size for you. What is the right size of the FlipBelt? Here you can find out what is the right size for you. If you are looking for an innovative and modern solution to carry your phone and accessories like keys of IDs, the FlipBelt Classic can represent a good option. The patented design of the belt allows you to store all of these objects and have your hands free while working out. Since the belt comes with a tight fit, it will work to minimize and eliminate bounce; improving comfort and making you focus on your physical activity. But the design of the belt also recommends it for its versatility. Thus, you can use it for your basic running activities or for long walks where you prefer to concentrate on the scenery. The belt also works for travelers. For example, if you are carrying a big backpack and need a quick solution for your phone and documents having them at hand all the time, the belt can represent a top recommendation. It will also help you keep an eye on your money, as having them away from your pockets can improve your overall safety in some situations. The belt also represents a good option at the gym. Since there are many indoor sports to choose from, you can keep your hands free at all times to maneuver gym equipment while safely storing your phone and accessories. You can even plug your earplugs into your smartphone while working out, giving you the freedom to use all types of weight for your workout. FlipBelt is suitable for other outdoor activities also. Other outdoor activities which are suitable for the belt are walks, shopping or even festivals. Since you will eliminate the need for bulky belts you will have the opportunity of using a modern design which can represent a good option for your basic storage needs. Made with a comfortable but fit design, the belt can be an option regardless of your waist’s size, since it can accommodate all types of bodies. So what are the top reasons to consider the flip belt? A good starting point with the belt comes with comfort. If you are tired of all the complicated solutions with many zippers and pockets which never get used, the belt can represent a good and simple option. Another top reason for choosing the FlipBelt comes with washing and drying needs. You can just place the belt in the washing machine together with other clothing to remove the bacterium which builds up in time. The good news is that the belt is also quick to dry which means you can use soon after getting it out of the washing machine. But remember that the belt is not waterproof, and also if you sweat a lot, it may absorb through. So with electronics zip lock back is recommended. If you`re unsure about the usability of the Flip Belt you can always compare to some traditional options which might give you a better understanding of what to expect. 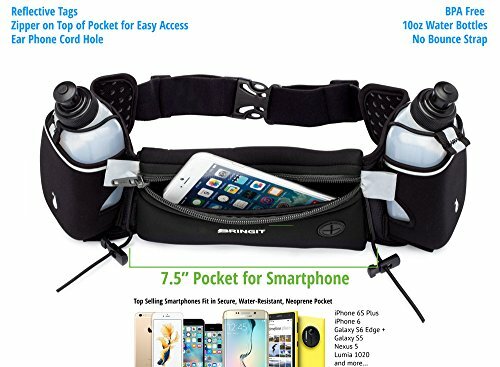 This is why you can compare it against a similar design made for smartphones like the Running Hydration Belt with Water Bottles. One of the main differences comes with the hydration bottles. Since you might think that the FlipBelt doesn’t have these options, you can actually purchase flat-design water bottles which fit similarly to a smartphone. This means that even if the FlipBelt doesn`t carry as much water, it can still be a good option in terms of practicality. You can carry water hands-free with a new water bottle from FitBelt. The fit and comfort of the FlipBelt are also far superior. It will actually eliminate bounce making you concentrate on your fitness routine or physical activity. The FlipBelt is also far easier to wash and dry. Thus, you will always have a clean belt which is ready to be used. The only downside comes with adjustability. The FlipBelt size chart only recommends it for one user. This is why you should only consider it if you plan to use it yourself and not together with your partner or family. The FlipBelt Classic is one of the innovative designs of the modern fitness enthusiast. But since the belt represents such a low impact solution for all types of situations, it goes beyond fitness and can be used while traveling or even at concerts. If you want to compare Zipper vs Classic, you can check the prize of Flipbelt Zipper here. The good news is that once you find your size, the belt represents a good option to store your smartphone, money, asthma inhaler and even keys away from your pockets. It improves your comfort as you don`t have to constantly worry about the safety and location of these objects. One thing that the manufacturer clearly states is to stay away from counterfeit options which might be available on the market. The quality of the product can only be ensured with the original design which works for all of the reasons above and for the added durability. If you need a simple solution for your basic accessories while running or working out, the Classic model can be a recommended option regardless of your weight or size. You will find the belt to be a good option to keep your smartphone and you can even go further in purchasing a small water bottle and a small wallet to keep your money in a secure pouch. If you want to check the differences between Classic and Zipper, you can find our updated review of FlipBelt Zipper here. FlipBelt Classic Edition - Black Extra Extra Large 40"-48"